She writes that there is a growing consensus among educators and legislators that grades, standardized tests — even homework — cannot accurately reflect a students’ skills. Further, she sees these tools as poor measures of students’ abilities that in turn, can deepen inequities between individual students. McKenna notes that more than 70 colleges and universities in the United States have signed formal statements asserting the nation’s centuries-old grading system doesn’t work and indicating that change is not only on the horizon, but is welcomed. Subsequently, the Mastery Transcript Consortium (MTC) was formed last April and is now made up of nearly 160 independent schools, each committed to exchanging its existing grade-based transcripts and GPAs for a digital, interactive format. That format, according to McKenna, showcases a student’s academic and enrichment skills, as well as requiring a major project from each student, such as a personal video or a portfolio of writing or artwork. In that manner, McKenna writes, students take courses that establish the competencies they’ve developed instead of just marinating in a seat for credit hours and received A-F grades. In the future, educators expect transcripts to offer a list of skills, such as critical thinking, creativity and self-directed learning, which MTC founders insist can be easily diagnosed by college admissions officers. Here at Eagle Rock School and Professional Development Center, we have long supported and participated in the development of competency-based approaches to educating high school students. Specifically, students enrolled in Eagle Rock School are coached, supported and challenged to meet a knowledge, skills or reasoning target rather than ranking them against one another in relation to how they did in a fixed-time, fixed-curriculum setting. And because competency-based education increases the chances of equitable outcomes, all Eagle Rock School students are held to same high expectations, wherein the unit of success is in achieving the outcome. For instance, in most traditional schools today, a 10th grader with an A in algebra and another student earning a C in algebra receive the exact same advisement, which means that since they both passed the class, they are placed in the next indicated course, completely ignoring the wide variety of competency attainment. We believe this outmoded thinking is all about going through a course sequence rather than being constructed around learning. At Eagle Rock — and at many of the schools we support through our Professional Development Center — competency-based education teaches students that learning can occur anywhere and at any time. Take for example the student who applies her mathematics knowledge to develop and design Las Vegas-style gaming environments that accurately demonstrate her skills in math. * Or a self-taught guitarist, who on his own volition and through months of study and practice, greatly improves his talents on his chosen instrument. In a traditional school setting, this achievement would only count if that student regularly attended a music class and performed in front of a music teacher. Eagle Rock School strives to take such an approach in graduating our students in the context of our 5 Expectations, as well as daily practice using learning targets. These expectations include learning to communicate effectively; expanding one’s knowledge base; becoming an engaged global citizen; acquiring leadership skills in order to achieve justice; and creating healthy life choices. This year’s focus on common assessment (see: Eagle Rock’s ‘School Improvement Project’ Focuses on Common Assessment) is designed specifically to strengthen that approach. Outside of our mountainside campus, our Professional Development Center is supporting Future Focused Education — formerly known as the New Mexico Center for School Leadership — as well as Learning Alliance New Mexico and STEM-New Mexico in developing competency-based approaches to education. We also are supporting competency-based learning at Rise Up Community School in Denver and a number of schools and districts in Vermont, as well as iLead Schools in California. Finally, we are an active member of Pioneer Lab — an initiative of Education Reimagined — with the goal of making learner-centered education inevitable and irreversible. And, of course, among their key distinctions for a learner-centered environment is competency-based education. As competency-based education gains acceptance with public and private schools across the country, Eagle Rock — and in particular, our Professional Development Center — stands ready to help administrators and educators alike navigate toward change. To seek our assistance or resources, connect with us first through the online Contact Form available on our website. About the Author: Michael Soguero is the director of professional development at Eagle Rock School and Professional Development Center in Estes Park, Colo. There, he is responsible for developing approaches that positively affects public education throughout the United States. 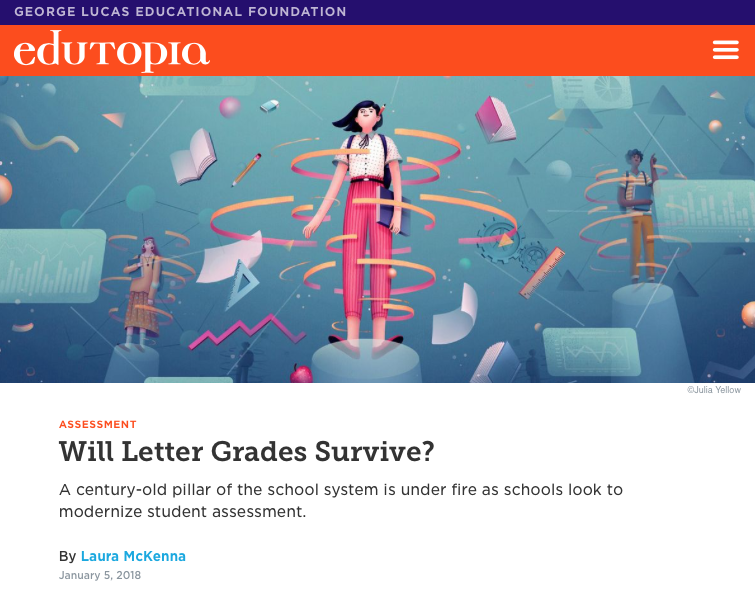 This entry was posted in Performance Assessment and tagged Competency-based Education, Edutopia, Future Focused Education, Laura McKenna, Letter Grades, Mastery Transcript Consortium, Michael Soguero, Pioneer Lab, Rise Up Community School.